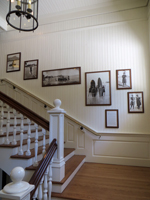 See the Hawaii Memorabilia Collection at the Moana Surf Rider Hotel. Enjoy Hawaii Memorabilia at the Moana Surf Rider! For starters, the Moana Surf Rider Hotel is a piece of Hawaii memorabilia in itself. This very first Waikiki Beach hotel opened in 1901 and ushered-in a new era for the islands! 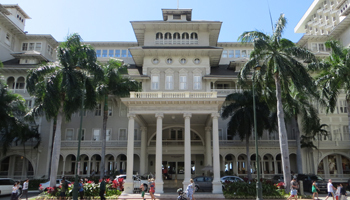 With its arches, ionic columns, and architectural panache, this “First Lady of Waikiki” (as they sometimes call it) was an elegant and innovative centerpiece of the burgeoning Hawaii tourism industry. At that time, Waikiki consisted of little more than swamplands surrounding the summer homes of Hawaiian royalty and Oahu’s richest residents. Guests had to be transported to the entrance by mule-drawn trolleys. Obviously, Waikiki has changed a lot since those days; and the hotel itself has undergone extensive renovations. Nevertheless, the original Banyan Wing, which is listed in the National Register of Historic Places, still welcomes every visitor with its late-nineteenth century style. Personally, I’m a fan of turn-of-the-century architecture; which makes the Moana Surf Rider one of my favorite Waikiki Hotels for that reason alone. For anyone interested in a guided trek back in time, there’s a free one-hour historical tour every Monday, Wednesday, and Friday at 11am. 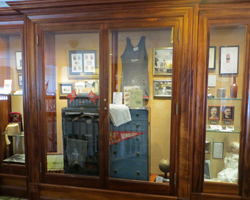 It begins on the second floor in the Historical Room; and no reservations or passes are required. According to the hotel’s concierge desk, this tour is open to the public and not exclusive to Moana Surf Rider guests. Just show up at the Historical Room and you should be good to go. 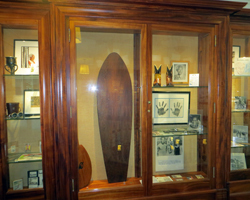 Exhibits include Hawaii memorabilia related to local legends such as Duke Kahanamoku and the popular worldwide radio show Hawaii Calls, which broadcasted from the hotel’s courtyard for 40 years (1935-1975)! 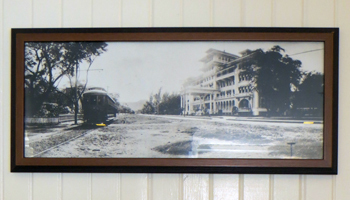 You can also learn about people and events that were significant in the hotel’s/Hawaii history. My personal favorite discovery was an old hand-written guest ledger with penmanship so perfect it made me sigh in shame. Don’t get me wrong… this isn’t a museum. It’s a fully-operational hotel that’s still totally committed to guest services. 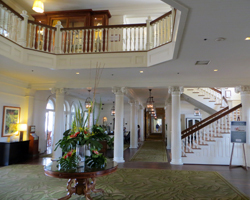 Thus, the lobby is primarily a place for visitor comfort and hospitality – not for people tramping in off the street expecting free Hawaii attractions. The Hawaii memorabilia is just an added bonus tucked here and there throughout the wing. Anybody can enjoy it any time – but not at the expense of disrupting the hotel’s paying guests. Basically, I’d suggest that you just give this historic Hawaii activity 10-15 minutes of your time as you’re on your way to the beach or to a meal. Heck, you might decide you want to kill two birds with one stone and enjoy the hotel’s history while you eat at its fantastic beachfront restaurant! Otherwise, take a look, learn something interesting, and then get on with your plans.